For our free sticker sheets, please send a SASE (self addressed STAMPED envelope) to 2658 Pacific Park Dr, Whittier, CA 90601.. Use a regular enveloped sized 4 1/8″ x 9 1/2″. 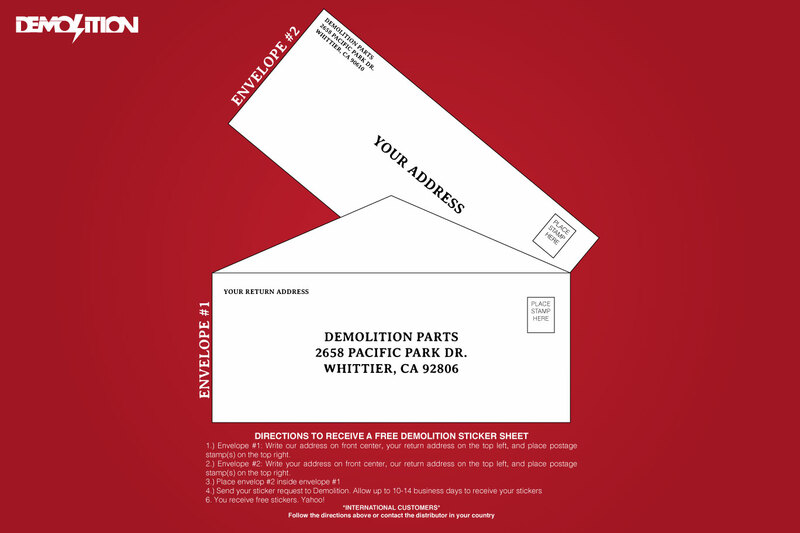 If you do want to use a bigger envelope, then make sure you use the correct postage (www.usps.com). If the correct postage isn’t used then it won’t make it to us or back to you. Further instructions are below. 1.) Envelope #1: Write our address on front center, your return address on the top left, and place postage stamp(s) on the top right. 2.) Envelope #2: Write your address on front center, our return address on the top left, and place postage stamp(s) on the top right.